The Philippines officially known as the Republic of the Philippines is a sovereign state in Southeast Asia in the western Pacific Ocean. To its north across the Luzon Strait lies Taiwan. West across the South China Sea sits Vietnam. The Sulu Sea to the southwest lies between the country and the island of Borneo, and to the south the Celebes Sea separates it from other islands of Indonesia. It is bounded on the east by the Philippine Sea. 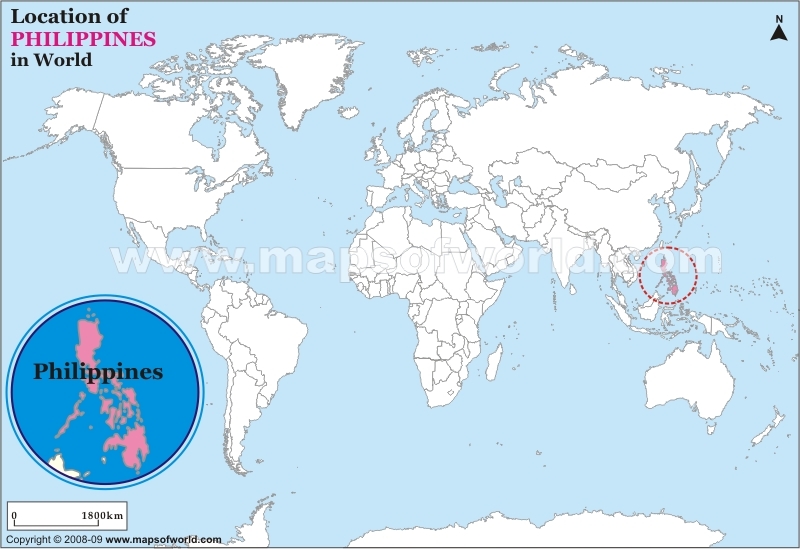 Its location on the Pacific Ring of Fire and its tropical climate make the Philippines prone to earthquakes and typhoons but have also endowed the country with natural resources and made it one of the richest areas of biodiversity in the world. An archipelago comprising 7,107 islands, the Philippines is categorized broadly into three main geographical divisions: Luzon, Visayas, and Mindanao. Its capital city is Manila. With a population of more than 92 million people, the Philippines is the 7th most populated Asian country and the 12th most populated country in the world. An additional 12.5 million Filipinos live overseas. Multiple ethnicities and cultures are found throughout the islands. In prehistoric times, Negritos were some of the archipelago's earliest inhabitants. They were followed by successive waves of Austronesian peoples who brought with them influences from Malay, Hindu, and Islamic societies. Trade introduced Chinese cultural influences which remain to this day. Manila became the Asian hub of the Manila–Acapulco galleon fleet. As the 19th century gave way to the 20th, there followed in quick succession the Philippine Revolution, which spawned the short-lived First Philippine Republic, the Spanish-American War, and the Philippine–American War. In the aftermath, the United States emerged as the dominant power; aside from the period of Japanese occupation, the United States retained sovereignty over the islands until the end of World War II when the Philippines gained independence. Since then, the Philippines has had an often tumultuous experience with democracy, with popular "people power" movements overthrowing a dictatorship in one instance but also underlining the institutional weaknesses of its constitutional republic in others. The peso is the currency of the Philippines. It is subdivided into 100 centavos. Before 1967, the language used on the banknotes and coins was English and so "peso" was the name used. The language was then changed to Filipino, so that the name of the currency as written on the banknotes and coins is now Piso. Trade among the early Filipinos and with traders from the neighboring islands was conducted through barter. The inconvenience of barter later led to the use of some objects as medium of exchange. 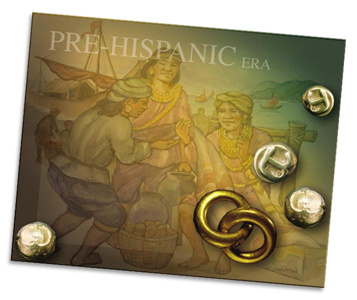 These objects included piloncitos and gold barter rings. Piloncitos are small bead-like gold bits, and they are considered by the local numismatists as the earliest coin of the ancient Filipinos. The Spaniards brought their coined money when they came in 1521 and the first European coin which reaches the Philippine Islands with Magellan's arrival was the teston or four-reales silver coin. The teston became the de facto unit of trade between Spaniards and Filipinos before the founding of Manila in 1574. The native name for the coin was salapi. The cobs or macuquinas of colonial mints were the earliest coins brought in by the galleons from Mexico and other Spanish colonies. The silver dos mundos or pillar dollar is considered one of the world's most beautiful coins. The barilla, a crude bronze or copper coin worth about one centavo, was the first coin struck in the country. Coins from other Spanish colonies also reached the Philippines and were counterstamped. Gold coins with the portrait of Queen Isabela were minted in Manila. Silver pesos with the profile of young Alfonso XIII were the last coins minted in Spain. 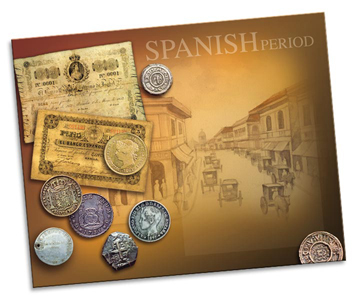 The pesos fuertes, issued by the country's first bank, the El Banco Espanol Filipino de Isabel II, were the first paper money circulated in the country. 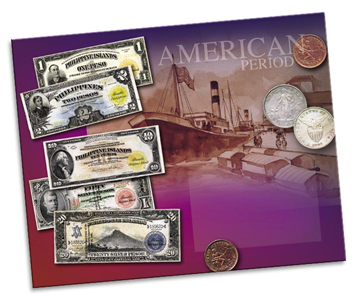 Asserting its independence, the Philippine Republic of 1898 under General Emilio Aguinaldo issued its own coins and paper currency backed by the country's natural resources. One peso and five peso notes printed as Republika Filipina Papel Moneda de Un Peso and Cinco Pesos were freely circulated. 2 centimos de peso copper were also issued in 1899. The coins were the first to use the name centavo for the subdivision of the peso. The island of Panay also issued revolutionary coinage. After Aguinaldo's capture by American forces in Palanan, Isabela on March 23, 1901, the revolutionary peso ceased to exist. The outbreak of World War II caused serious disturbances in the Philippine monetary system. Two kinds of notes circulated in the country during this period. The Japanese Occupation Forces issued war notes in big denominations. Provinces and municipalities, on the other hand, issued their own guerrilla notes or resistance currencies, most of which were sanctioned by the Philippine government in-exile, and partially redeemed after the war. Emergency circulating notes (also termed "guerrilla pesos") were also issued by banks and local governments, using crude inks and materials, which were redeemable in silver pesos after the end of the war. The Japanese-sponsored Second Philippine Republic under José P. Laurel outlawed possession of guerrilla currency and declared a monopoly on the issuance of money and anyone found to possess guerrilla notes could be arrested. Because of the nature of the currency, the Philippine economy felt the effects of hyperinflation. With the establishment of the Central Bank of the Philippines in 1949, the first currencies issued were the English series notes printed by the Thomas de la Rue & Co., Ltd. in England and the coins minted at the US Bureau of Mint. 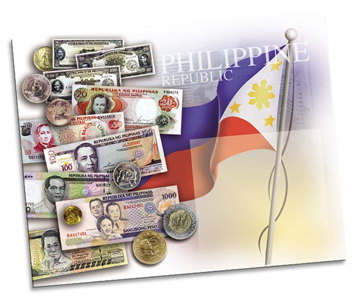 The Filipinazation of the Republic coins and paper money began in the late 60's and is carried through to the present. In the 70's, the Ang Bagong Lipunan (ABL) series notes were circulated, which were printed at the Security Printing Plant starting 1978. A new wave of change swept through the Philippine coinage system with the flora and fauna coins initially issued in 1983. These series featured national heroes and species of flora and fauna. The new design series of banknotes issued in 1985 replaced the ABL series. Ten years later, a new set of coins and notes were issued carrying the logo of the Bangko Sentral ng Pilipinas. In 1967, the language used on all coins and banknotes was changed to Tagalog. As a consequence, the wordings of the currency changed from centavo and peso to sentimo and piso. Leprosy colony money was special money which circulated only in leprosy sanatoriums due to the fear that the leprosy bacteria would infect other people. Leprosy, however, is in fact not easily transmitted by casual contact, and such transmission as there is only happens through long term, constant and intimate contact with leprosy sufferers and not contact with everyday objects used by sufferers. The system of special colony money was used between 1901 and around 1955. Special coins were made in Manila for use in leprosy colonies in the Philippines in 1913. In 1947 paper money was issued inside the Culion colony because of Japanese invasion. The Philippine's mint mark is the letter A in the "Baybayin" or the ancient writing of Filipinos. The Coat of Arms of the Philippines features the eight-rayed sun of the Philippines with each ray representing the eight provinces (Batangas, Bulacan, Cavite, Manila, Laguna, Nueva Ecija, Pampanga and Tarlac) which were placed under martial law by Governor-General Ramón Blanco during the Philippine Revolution, and the three five-pointed stars representing the three primary geographic regions of Luzon, Visayas, and Mindanao. On the blue field on the dexter side is the eagle of the United States, and on the red field on the sinister is the lion of Coat of arms of Castile and León, both representing colonial history. It is also used by the Philippine National Bank.